Real estate in Muyenga is not cheap, but there are lots of great houses and apartments for rent and some good deals to find. Furnished apartments cost between $750 – $2,000. Families looking for a quality education for their children have access to Heritage International School in neighboring Kansanga (on the back side of the hill). This Christian school has beautiful grounds and a safe atmosphere. 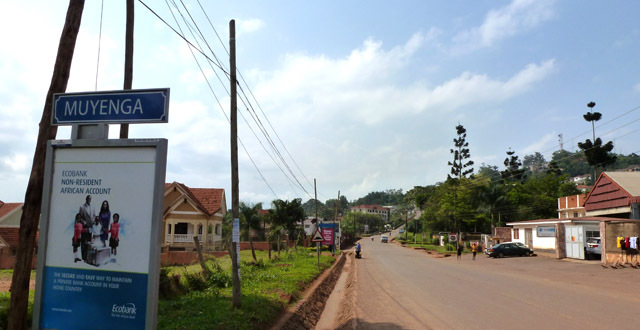 Muyenga has some of the best roads and infrastructure in Kampala and is known to be secure. Kampala Muyenga Apartments – Boutique two-bedroom apartments, nicely furnished, very secure setting. $1,100 / month. Short-term stays are $80 per night. Ray Apartments – Three-bedroom apartments with a balcony off of the master bedroom. Each apartment has a private entrance and a private garden. Call for rates. Muyenga Hotels are not luxury but they’re mostly nice, safe and cheap and often have surprisingly good views and access to good food. International Hotel – Located at the top of the hill with decent budget rooms and a nice pool. Safe and quiet location. Banda Inns – Economical B&B, great for families, exceptional service. Simple, clean rooms. Removed from the smog of Kampala. Breakfast available on a peaceful veranda. Very quiet and safe location, free wifi and free laundry! Guesthouses available for extended stays. Hotel Diplomate – Helpful staff, dated decor, rumours of funny smells and noises, gorgeous views of the city and the lake, probably one of the best in the city. The hotel was originally planned as a residence for Mr. Bonny Katatumba, the owner and current Pakistan Consul in Uganda, which might account for the name which seems to be a misspelling of “Diplomat.” Oops! Rooms starting at $35 per night. Orchidea Guesthouse – Attached to cafe Roma, these gorgeous little cottages offer quaint accommodation at great prices. Each cottage has a sitting room and the grounds are beautiful.Prices start at $70 a night. Chez Johnson Hotel – Decent rooms with the perk of balconies, and good prices. About $45 a night. Hotel Kenrock – One of the best budget options in Muyenga! Very accommodating staff, clean, simple rooms. Free in-room wifi, garden with food and drinks. Spacious rooms, some with balconies. Close to all of the shopping and restaurants in Muyenga. Rooms go for different rates but a large room with a balcony can be as cheap as $20 per night! Adonai House – Clean, simple rooms, wireless internet, fans, breakfast provided, up the road from Cafe Roma. Cold showers! Only $30 a night. Lopez Motel – Very basic, clean rooms, walking distance from Kabalagala. A bit noisy, but close to the action. Around $20 a night. Tank Hill/Rest Corner shopping strip is great. You can’t find all of the imported odds and ends that are available at the bigger chains but the pace is more relaxed at these smaller, independent shops. In front of Italian Supermarket there is a flower vendor where you can pick up fresh cuts at good prices. You can also take a break from grocery shopping in the heat and sit and enjoy a Gelato at Ciao Ciao Italian Ice cream. Personalized touches like beading classes at Taloso Bead Jewellers boutique make Muyenga feel really accessible. Italian Supermarket/Reste Corner – This little grocery store at the crossroads of Muyenga carries almost everything you could need and has some imported treats. Ciao Ciao Italian Ice Cream Snack Bar next door serves delicious ice cream and has a buffet of rice, matooke, beef, chicken, potatoes. There’s a Barclay’s Bank on the same strip. There is also a small florist vendor outside of Italian super market during the day. Wine Garage – Small wine shop, good selection. They also have a small patio where you can sit and enjoy a glass of wine. African Craft Shop at Reste Corner – Typical Ugandan arts and crafts. Taloso Bead Jewellers – A small boutique that Specializes in beaded jewelry, interesting materials like shells, stones and Uganda’s famous paper beads. They also sell shoes, bags, custom jewelery and offer beading classes! Recreation in Muyenga includes various small restaurants and hidden gems, which have some great prices. Muyenga Club is also a nice place to spend an afternoon in the fitness center or at the pool. Entry is three bucks. The nearest nightlife is in Kabalagala, which isn’t technically Muyenga but borders it. Kabalagala is a hot-spot for rowdy entertainment. It’s the center for Ugandan bars and nightlife that don’t cater to expats, and there’s good street food available all night from whole fish and chickens, to local, fried breads. My favorite restaurant, Little Donkey, is in Muyenga. I’ve sent people there before and they haven’t seen the charm the way that I do saying, “I could make the same thing at home and it would be way better!”. This maybe true, and so I’ve begun to realize that maybe what I love about Little Donkey is the cheap, cheap food and the super friendly and wonderful staff. It’s a great place to forgo cooking without feeling like you’ve broke your budget. Other options in Muyenga are also decently cheap and there is a lot of good pizza to be found! Indian Summer – An outdoor patio that serves good Indian food at fair prices. Every time we go with a large group it takes hours to get the food and the order is mixed up. The food is good if you can handle the wait! Little Donkey – A hole in the wall Mexican restaurant, great with a few friends or a group of no more than ten. This tiny, bright, casual restaurant offers exceptional service and some of the best Mexican (inspired) food in Kampala. Good cheese is pricy in Uganda, so plates full of melted cheese nachos or yummy quesadillas from 8,000-12,000 UGX is almost too good to be true! The whole menu is worth a try and entirely affordable. Make sure you ask for churros for dessert! Cafe Roma – Charming Italian-owned cafe that serves really delicious, authentic Italian food and gelato at midline prices. Has a cute play area for kids. The Woods – Bad service, lots of mosquitos but a nice atmosphere. Really good food, especially pizza. They have one of the chefs from Cafe Roma; the pizza is just as good but you’ll spend half the money. A hidden treat. Wasabi – A nice Japanese food restaurant. Definitely worth a try! Palm Cafe Pizzeria – Outside seating on the main road, decent service/atmosphere. Good, cheap pizza. Coconut Shack – Famous for good wine and Indian food, lamp-lit patio seating. Cafe Kawa – Adorable atmosphere, good coffee, espresso, salads and light sandwiches. Indoor and outdoor seating, wifi! Wine Garage – Small wine shop, good selection. They also have a small patio where you can sit and enjoy a glass of wine. Half off of wine, happy hour, wednesdays from 5:00-7:00. This is a great place to spend a relaxing evening unwinding from work. Promotes local artists. There isn’t any noteworthy nightlife in Muyenga but check out neighboring Kabalagala for a cool, local experience. Kabalagala is one of the only places in Kampala where you can find bustling life late into weeknights, it never shuts down. The street food, energy, beer and crowds can sustain you on a bored Tuesday night or wisk you away into a dancing frenzy on the weekends. Capitol Pub – One of the landmarks in Kabalagala, but I wouldn’t recommend it as a place to spend time. It’s got cool, grimy energy with a huge tree growing in the middle of the bar, but it’s also famous for being full of prostitutes, which can cause it to be a heart-wrenching experience for those with a social conscience. I prefer newer bars like DePosh and TimeLezz. DePosh – A good place to lounge on the patio under glowing, tangled Christmas lights hanging in the trees and sometimes to catch live jazz. Hookah available. Time Lezz – The upper level has good energy and feels like an open cabin in the woods. It’s $2 at the door, but you get a bear with entry. There’s a fun dance floor, where you’ll often be relied on to get the party started, but can usually depend on a crowd to follow suit. There’s also a pool table and some bar seating. IHK, International Hospital Kampala is the largest provider of private medical services in Kampala and has emergency and ambulance services and several specialist clinics and various medical insurance policies. The hospital is regarded as one of the leaders in Ugandan healthcare. It is fine for basic illnesses. For more serious issues, find Dr. Stockley at The Surgery in Kololo. I thought Wasabi closed. The best Japanese Restaurant in the area, is Samuri out Ggaba Rod, Bunga. I also thought Wasabi was closed?? For a long time now! Italian Supermarket is one of the worst places to shop from. There are just too many complaints that have been made by its customers over the last 3 years. The products in Italian Super market have been found to be either substandard, defiled, or very harmful to its customers. The supermarket was originally owned by Italian, and that was when it was at its best. But the quality of the products and services seriously deteriorated after it was sold off to the Chinese who currently own it. I am moving to Kampala in September. I wonder wether there is a group of Uganda expats or Kampala expats that I could join as I would like to find out about life in Kampala, things to do, house for rent, car and etc. All these things that one has to do when arriving in a new place. Thanks for your help. Time Lezz – The upper level has good energy and feels like an open cabin in the woods. It’s $2 at the door, but you get a bear with entry. There’s a fun dance floor, where you’ll often be relied on to get the party started, but can usually depend on a crowd to follow suit. There’s also a pool table and some bar seating…. The bazungu owners at Time Lezz can be heavy-handed. And the healthcare section…am I the only one who wouldn’t go NEAR Stockley if I had a serious medical issue? Just because he’s white doesn’t mean he’s good!